I thought I was going to rip Cisco a new one with something in mind with the WS-3560-CG switches. I thought since it didn't come with a power adapter (external that is), that I was a little upset with them for trying to sell a power adapter for just trying to get the unit up and going. However, a little cool thing was that the switch runs off of POE from an upstream POE switch (3560CPD-8PT-S only). Now, Im really not a fan of this for a few reasons. One, what if your upstream unit is already at its power max? Two, I would think over long distances POE would be degraded over the long haul of the Cat5/6 cable. 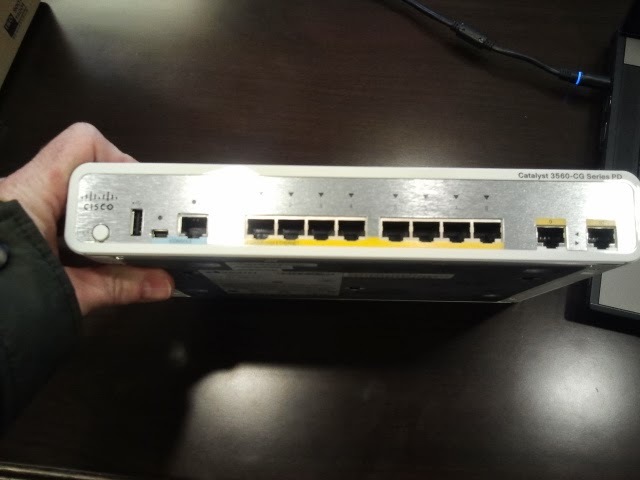 Three, if the upstream switch goes out, you are done with this switch as well (now that might not matter to some, but if you have a backup link to a non-POE switch, it would matter). Some good things about it is that if you have the switch where power is not run, I can see that being good. But overall, I wouldn't want this 'feature'. Call me old school I guess. What Im really not impressed with is the hardware specs. They claim a whopping forwarding rate of 14.9 mpps and a switching backplane of 10G with the WS-3560CG-8PC-S model (and that is the top end 3560-CG). The lower end with a forwarding rate of 4.2 mpps. Unless you need that POE in the corner of the building where there is no power plugs, I personally would go with something different, simply because of the performance specs.